22nd July 2018 – On a busy weekend of Diamond League Athletics, PACE athletes were taking victories, setting new PB’s and even new national records. 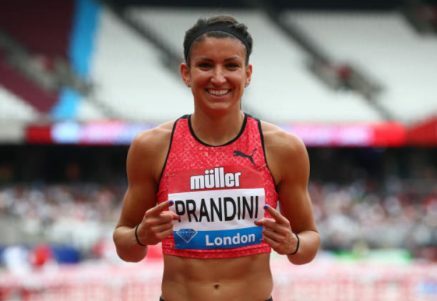 Jenna Prandini (USA) and Matthew Centrowitz (USA) were to the fore of the action as they competed in both Monaco on Friday night and then London on Sunday afternoon. Jenna started by taking fourth place in the 100m in Monaco clocking 11.09 seconds and then followed that with a storming victory in the 200m in London setting a new PB of 22.16 seconds in the process. Dina Asher-Smith (GBR) was fourth in London in a seasons best 22.25 seconds. In Monaco, once more the 1500m delivered an exceptional race with eleven men running inside 3:33.00 and Matthew running his third fastest time ever to take seventh place in 3:31.77. In London, in a race that bore a far greater resemblance to a Championship race Matthew showed his tactical prowess and finishing speed by taking the win in 3:35.22. Vincent Kibet (KEN) was ninth in a seasons bets of 3:36.12. Having taken victory over 400m hurdles in Lausanne, Shamier Little (USA) was the winner again in London. It was far from easy though as she fought with Jamaican rival Janieve Russell all the way to the line taking it on the dip by just 1/100th of a second in 53.95 seconds. A week after winning the Welsh title as a guest Ristananna Tracey (JAM) was sixth in 56.07 seconds. Hellen Obiri (KEN) was not able to repeat her victory in the 1-mile event from the London meeting last year placing third on this occasion, but she was able to repeat breaking her Kenyan and Commonwealth Record setting new figures of 4:16.15. After a consistent spell of training Winny Chebet (KEN) showed a return to form with a seventh-place finish in 4:20.51. Two weeks out from the European Championships Matthew Hudson-Smith (GBR) showed that his preparations are right where they need to be as he set a seasons best and new European lead of 44.63 seconds for sixth in the 400m in London. Another athlete heading to the Europeans is Stephanie Twell (GBR) and she ran 8:47.93 in the 3000m for sixth place in London. Having taken victory in Cork earlier in the week, Laura Roesler (USA) set a seasons best of 2:00.45 over 800m and was fourth in London. Away from the Diamond League, Bralon Taplin won the 400m at the Nevis Culturama Games in St Kitts with a time of 44.88 seconds.